She won't be answering the White House telephone at 3 a.m., but Hillary Clinton may still play a powerful role in the next administration. 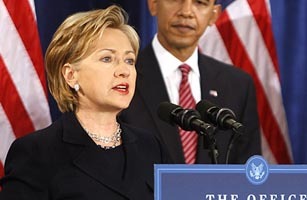 On Monday, President-elect Barack Obama introduced Clinton as his choice for Secretary of State, ending a weeks-long saga of rumors, press leaks, political back-biting and negotiations with Clinton's husband, former President Bill Clinton, who eventually agreed to release the long-secret list of donors to his charitable foundation to avoid any conflicts of interest. Bitter campaign rivalry aside, pundits and politicians have praised the choice, noting that Clinton's high-profile status is well-suited to the role of America's top diplomat  a daunting post made more difficult by deteriorating relations with Iran, North Korea and Pakistan. Still, some wonder if her outsized ambitions might be too much for the job.  Born in 1946, raised in a Chicago suburb where her father owned a textile business. Biographer Carl Bernstein describes Clinton's father, Hugh, as a domineering, verbally abusive figure: "Life in the Rodham household resembled a kind of boot camp, presided over by a belittling, impossible-to-satisfy drill instructor."  Began her political life as a "Goldwater Girl," campaigning for Arizona Republican Barry Goldwater in 1964 before switching parties following the assassinations of Martin Luther King, Jr., Robert F. Kennedy and Malcom X.  Attended the all-girls Wellesley College, where she served as student-body president and helped the campus avoid the violence typical of American colleges during the late '60s. She appeared in Life magazine in 1969 for her widely praised commencement address.  Met Bill Clinton while attending law school at Yale. Recalling their first encounter, Hillary says she approached Bill and bluntly stated, "If you're going to keep looking at me, and I'm going to keep looking back, we might as well be introduced. I'm Hillary Rodham." The pair married in 1975. She kept her maiden name until 1982.  Gave birth to Chelsea Victoria in 1980, after struggling for years to get pregnant. At age 49, Hillary startled a reporter by saying that she and Bill were "hoping to have another child."  Worked as a lawyer and child advocate throughout Bill's tenure as Arkansas governor; became Arkansas Woman of the Year in 1983 and Arkansas Young Mother of the Year in 1984; the National Law Journal twice named her one of the nation's 100 most influential lawyers.  After Bill won the 1992 presidential election, she became the first First Lady to set up her own office in the West Wing and later chaired the failed Task Force on National Health Care, sessions of which she controversially closed to the public.  Became the first First Lady to win elective office in 2000 when she defeated Rick Lazio to become a New York Senator. "To appoint a very strong personality into a prominent cabinet position requires a great deal of courage."  Henry Kissinger, former Secretary of State, praising Hillary as Obama's likely choice (ABC News, Nov. 16, 2008). "Is Obama considering Mrs. Clinton for this job in order to get her off his back or as a prelude to protecting her back?"  Columnist Thomas Friedman (New York Times, November 21, 2008). "New York will lose a powerful voice in the Senate. But the nation will gain a powerful voice in the world."  New York Gov. David A. Paterson (MSNBC, Dec. 1, 2008). "You know the old phrase 'You keep your friends close and your enemies closer?' He puts her over at Secretary of State, how can she run for President in 2012?" "This is fun for the press to try to stir up whatever quotes were generated in the course of the campaign  no, I understand  and you're having fun, and there's nothing wrong with that."  President-Elect Barack Obama, dismissing questions about their political differences (CNN; Dec. 1, 2008). "Let's be clear, withdrawal is not defeat. Defeat is keeping troops in Iraq for 100 years."  On her foreign-policy agenda (BBC, March 19, 2008). "The path will be a little easier next time."  Conceding defeat to Democratic rival Barack Obama during her campaign to become the first female President of the U.S.(AP, June 7, 2008). "America cannot solve these crises without the world and the world cannot solve them without America."  Accepting Obama's nomination as Secretary of State (MSNBC, Dec. 1, 2008).